A private owner has let me know about a painting in his possession, thought to be by Eyre Crowe and dating from 1871. 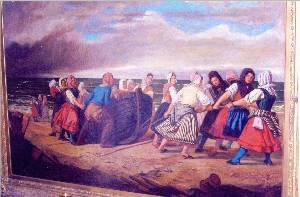 Pulling the boat ashore seems to show a group of Breton women pulling a fishing boat onto a beach. The composition of the picture, with multiple characters arranged in a line, is very reminiscent of other paintings by Crowe, including At the pit-door (1873) The Dinner Hour, Wigan (1874), and Nelson Leaving England for the Last Time (1888). This entry was posted on Wednesday, May 19th, 2010 at 5:27 pm and is filed under Pictures. You can follow any responses to this entry through the RSS 2.0 feed. You can leave a response, or trackback from your own site.